The immigration level for the next four years is fixed at 160,000 as opposed to 190,000 in the previous year. However, the immigration place will be easily available to the migrants willing to come and settle on a permanent basis. From November 2019, the additional points will be awarded to the primary applicants if the primary applicant’s spouse has competent English but was unable to meet the requirements for skilled partner points. Single applicants will now be able to receive additional points to ensure they are not disadvantaged-. However, complete details of the process are not yet mentioned. The new Skilled Work Regional (Provisional) and Skilled Employer Sponsored Regional (Provisional) visa will be introduced from 1 November 2019. 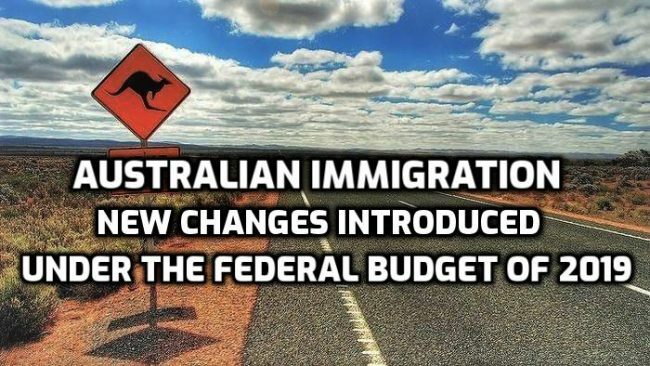 The government is trying all possible efforts to invite skilled migrants in the regional areas to live and contribute towards the Australian economy. The Australian Immigration Department has announced the scholarship for International and domestic students to study in regional Australia for higher education or vocational education qualifications. Subclass 408 VACs waived for athletes and officials for the 2019 INAS Global Games in Brisbane VACs waived for competitors and officials for the International Cricket Council T20 World Cup 2020. Fees for skills assessment related to migration, employment and licensing will be collected by TRA and will be fully recovered.